The following bulletin concerns the use of Tannerite, an explosive marketed for the purpose of creating exploding targets for firearms practice, as a source of ammonium nitrate for the manufacture of methamphetamine. The bulletin references an FBI bulletin from 2013 that warned of the use of Tannerite in the construction of improvised explosive devices (IEDs). The bulletin was obtained from the website of the University of Buffalo Office of Prehospital Care. (U//DSEN) The Drug Enforcement Administration (DEA) Plattsburgh Resident Office (RO) and the New York State Police (NYSP) received credible reporting that Tannerite® is being used as a substitute for ammonium nitrate using the “one-pot” methamphetamine manufacturing method. Tannerite®, an explosive powder, is otherwise used in the making of exploding firearms targets. This is the first time this particular process has been reported in the New York Division’s area of responsibility (AOR). (U//DSEN) Criminal possession of methamphetamine manufacturing material at the state level requires the possession of specific items at the same time: a precursor, and a solvent or chemical reagent. Typically, methamphetamine cooks use pseudoephedrine, Coleman® fuel, and cold packs. 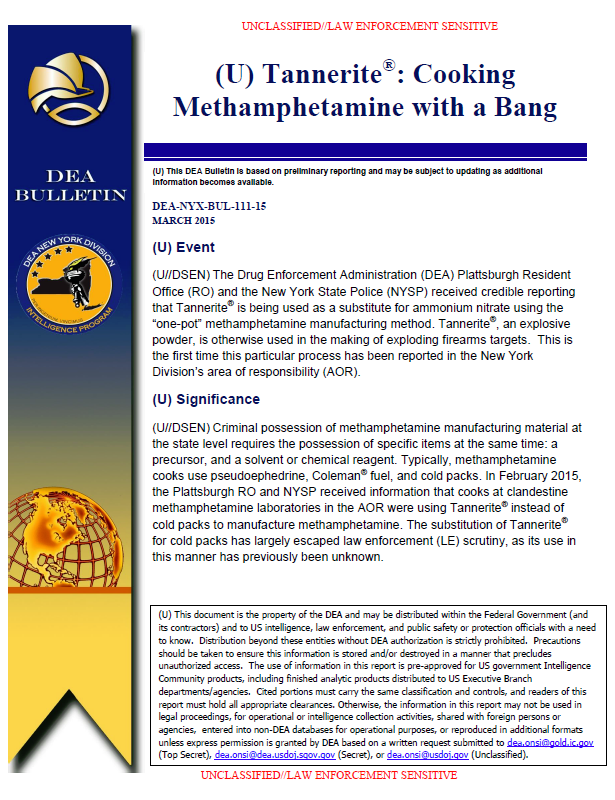 In February 2015, the Plattsburgh RO and NYSP received information that cooks at clandestine methamphetamine laboratories in the AOR were using Tannerite® instead of cold packs to manufacture methamphetamine. The substitution of Tannerite® for cold packs has largely escaped law enforcement (LE) scrutiny, as its use in this manner has previously been unknown. (U//DSEN) Tannerite® is much easier to purchase than bulk cold packs and has not previously been linked to the production of methamphetamine in the New York AOR. According to a report published in 2013 by the Federal Bureau of Investigation, explosive targets (ETs), such as Tannerite®, are not regulated by the Bureau of Alcohol, Tobacco, Firearms and Explosives because they don’t meet the definition of explosives outlined in the Code of Federal Regulations. Thus, anyone can purchase ETs without a federal explosives license or permit and without expensive hazardous materials shipping fees or placards. (U//DSEN) In small rural areas where hunting is a common practice, the purchase of Tannerite for firearms target practice is prevalent. Tannerite® is relatively inexpensive and is currently not on LE’s radar as regards the manufacture of methamphetamine. (U//DSEN) Tannerite® is the brand name of a binary explosive marketed primarily for making exploding targets for firearms practice. It is a patented combination of ammonium nitrate (an oxidizer) and aluminum powder (a fuel) that is supplied as two separate powders that are mixed and shaken to produce an explosive. The ammonium nitrate portion of the Tannerite® is the desired component for the “one pot” manufacture of methamphetamine. Both the Special Testing and Research Laboratory and the Northeast Regional Laboratory of the DEA confirmed that Tannerite® can be used in place of cold packs to manufacture methamphetamine. (U//DSEN) Tannerite® is available at most outdoor/sporting goods-type stores where a one pound container sells for $7.99 U.S. currency (USC) and a four quantity sells for $39.99 USC. Tannerite® is not flammable. Its two components are not themselves explosive; even so, they are sold as two separate powders. Tannerite® can be transported and sold in many places without the legal restrictions that would otherwise apply to explosives. (U//DSEN) The yield ratio of Tannerite® to methamphetamine is unknown at this time. In January 2015, the DEA New England Field Division discovered for the first time, a “one pot” clandestine methamphetamine lab in Claremont, New Hampshire, where Tannerite® was used in the cooking process. (U//DSEN) The ammonium nitrate component makes Tannerite® appealing for clandestine methamphetamine producers. The substitution of Tannerite® for cold packs is a viable, discreet and untapped technique which could potentially alter the method used by local clandestine methamphetamine producers. DEA New York Division will continue to monitor this emerging trend.